Okay, so it’s not a full picture of me. But I wanted to give people a visual of my weight loss (or in this case, a start to my weight loss) because a picture can show the weight loss more than the scale sometimes. Along with the scale, pictures are an important way to measure weight loss, especially when looking at before/after photos. We get mental images in our mind of how we look, and sometimes the only way to overcome that is to see those photos. It was very hard to post these pictures. I have a hard time looking at myself and not pointing out every single flaw that I see. I see all the weight around my midsection, my thighs, my arms, and I hate it. I want to hide all of those things, and only focus on things that are only slightly more appealing, like the almost-but-not-quite-there hourglass that is starting to appear, and my décolletage. You can’t see it in the picture, obviously, but I do have a great smile, and I try to always have it on my face, even if I’m having a bad day. If people focus on my smile, maybe they won’t see the weight. I would love to be able to make light of what I see in these pictures, but I can’t. The truth is that I hate what I see in the mirror. That’s why I’m working on changing my lifestyle. In order to be truly and completely happy, I need to be able to love myself. I am a work in progress, and each day gets a little bit better! 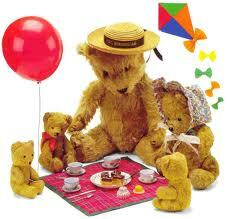 Today is Teddy Bear Picnic Day! Grab your favorite stuffed teddy bear, a blanket, and a basket of food! Make sure to include a Hotdog (July is National Hot Dog Month), or even better, a grilled hotdog because July is also National Grilling Month! If hotdogs aren’t your thing, July is also the month to celebrate Ice Cream, Blackberries, Watermelon, Horseradish, Pickles, Lasagna, Baked Beans and Sandwiches! Take your pick, and share a moment with your teddy bear! I’m just not hungry. I’m not avoiding eating for any reason, I just don’t feel like eating. I almost wish I could eat something so that my net calories are not so extremely low, but I don’t want to eat just to eat. If I eat I want it to be because I’m hungry and need to eat.